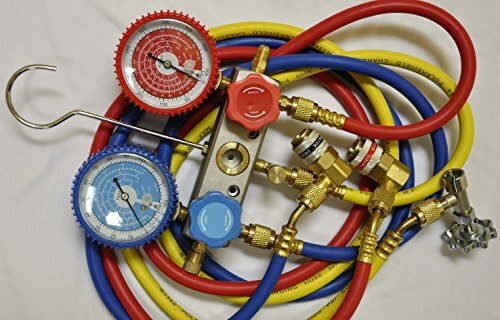 You are Looking at a a Brand new kit of 3 Tools: Manifold Set, Model: GMad with aluminum body,5-ft 3-colored refrigeration Hoses; Car AC Port Quick Couplers/Snap-on Connectors, Model QCPL; And R134a Can Tap/Tapper/Opener 1/4"Flare FEATURES: 1: R22, R12, R134a, R404a Manifold Gauge: Gauges: Large 2 1/2" in diameter, easy-to-read, mounted on Brass frame. with Large sight viewing glass on the utility line. with rubber shield/cover on the gauges to protect the gauge. Large easy-to-grab knobs on the sides Large port holes for faster recovery or charging, less restriction Pressure in PSIG Temperature in Fahrenheit Refrigerants marked: R22, R12, R134a, R404A 3 Brass hose end anchors in the back of the gauges. 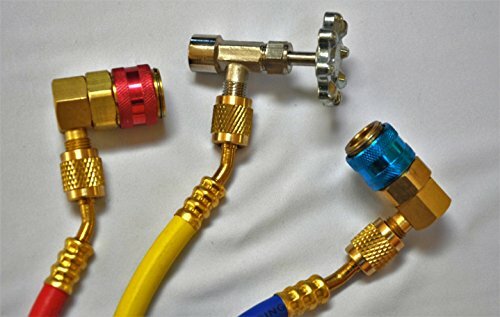 a heavy duty SS hook for hanging the gauges 2: Color Coded Hoses 5ft inch long each 3000 PSI burst pressure 600 PSI working pressure 1/4" female SAE brass fitting to the gauge block 1/4" female SAE brass fitting with 45 degree turn to the system ports. 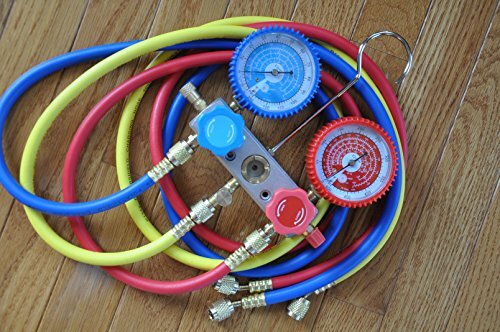 a package of hose seal repair kit is included in this sale 3: Plus, a Pair of Car AC system Port Quick Couplers/Connectors Set of 2, color coded quick connectors: Blue, Low side quick connector/adapter, 14mm to the car port, 1/4" mae flare to the manifold hose Red, High side quick connector/adapter, 16mm to the car port, 1/4" mae flare to the manifold hose All metal construction Quick action ball operated, safe design. R134a Can Tap Tapper Opener with 1/4" flare Connection 4: R134a can tapper, one piece. 1/2" Female ACME to the R134a can(American Standard), with hand operated punch control 1/4" male flare connector to manifold hose fitting or other tools. (NOTE: another model with 1/2" ACME Male connector Tap3 available) brass/SS fittings, constructed for charging R134a canisters. COme with car systemport couplers adapters and R134a can tapper for those Do-it-yourself folks. If you have any questions about this product by VIOT, contact us by completing and submitting the form below. If you are looking for a specif part number, please include it with your message.